Yesterday, I had a series of fascinating and educational professional sessions. I spent the morning with Norihiko Futagami, a park ranger who works in the Tohoku Regional Office for the Ministry of the Environment. He explained the national park system in Japan and we exchanged ideas about how to balance the need to preserve and protect the land while allowing for visitor use. The Japanese concept of a national park (kokuritsu koen) differs from the American system. Most of the lands in Japan that have been designated as a national park are not owned by the government, and homes and businesses exist inside the borders. Certain zones inside parks have restricted use, and in all areas of the park activity is regulated or managed to different degrees, but new building of homes and businesses can occur within park areas. The challenges we both face, however, are similar. Norihiko stated his top three challenges as being invasive species, fostering community support, and the small staff of rangers. He showed me a quick film that displayed an incredibly beautiful natural phenoma that occurs in his park—ju hyo (tree ice). When mist or fog gathers around the trees in winter, and the temperature drops suddenly, cloaks of ice form around the trees. Hundreds and hundreds of human-like trees stand guard over the winter landscape, an enchanting and mysterious sight. After touring a few park visitor centers, my guide for the day, Yoshio Kaneko, brought me to his classroom to speak to some of his students. 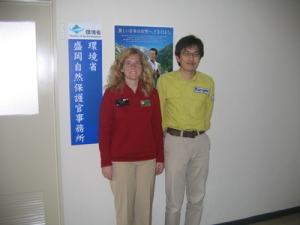 Yoshio teaches International Environmental Policy at Iwate University. His undergraduate and graduate students enjoyed seeing photographs of the park, and also were very interested in our wilderness permit system. When I mentioned my hometown of Boston, they all cheered for Daisuka Matsuzaka.